“New design and distribution philosophy to bring forth technological advancements in professional level paintball marker. March 29, 2008 DLX Technology is proud to announce the tournament debut of the Luxe professional tournament paintball marker at the 2008 NPPL Super-7 World Series tournament in Huntington Beach, California, March 28-30, 2008. 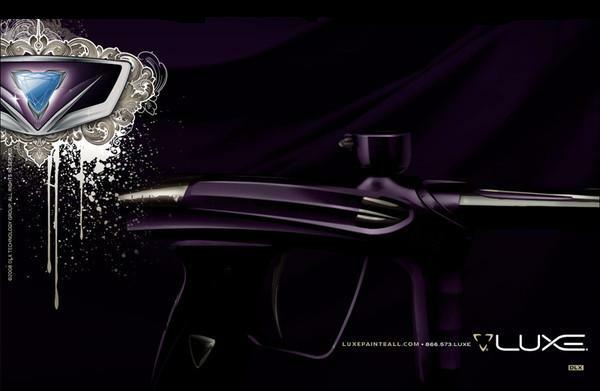 Some of the best professional paintball players in the world will gain an edge with the ultimate luxury paintball marker. Under the leadership of the DLX Technology group, the combined efforts of designers, pneumatic, mechanical, manufacturing and software engineers, multimedia developers, linguistic specialists, professional paintball players and leading paintball field and store operators have culminated in the development of the ultimate luxury paintball marker – a synchronization of style, raw performance and unparalleled customer support. Design of the Luxe started with a clean slate by championship winning pro players from the NXL and NPPL defining their needs, especially those that were not met by today’s markers. Speed, consistency, accuracy, gentle handling of brittle paint and a compact form factor were given, but the missing elements were not so obvious – speed of maintenance and ease of configuration. In today’s paintball tournaments every second in the staging area between points or best 2 out of 3 matches is critical, and that is where current paintball technology has fallen short – until now. Luxe innovations go well beyond the physical. The Luxe has been endowed with new means of communication. Although it has all of the programming flexibility serious tournament paintball players have come to expect, it has done away with the complexity. Memorization of beep and blink codes or carrying a manual to decipher them is unnecessary. Features are not the only aspect to set the Luxe apart. From the ground up, its high-performance alloy parts are machined in the United States, by American workers using the most advanced manufacturing processes available, a rarity in today’s paintball industry. The Luxe does not roll off of an assembly line. Instead each is hand built, tested and adjusted one at a time at DLX Technology by a Certified Luxe Technician, who is also an experienced professional paintball player with the background to know by feel when a marker is in top form. Much like a luxury car, the Luxe is not a mail-order product. Luxe markers will be available only through Luxe Certified Dealers who have the staff and training to provide a top-quality customer experience and post-sale technical support. Developed as a focused high-end design and manufacturing group owned by paintball industry leader Smart Parts, Inc., DLX Technology is dedicated to melding cutting edge technology with solid tournament performance to build the ultimate luxury paintball marker. There’s no need of a “disadvantages” section this time (this really is a flawless marker). So let me just once again point out that you can’t make a better choice than this one. Not for now anyway. The price – $1500 – is the only setback (for many), but even that can be a good thing. If you have that kind of money to spend on a marker – do it on this one. There’s just nothing else out there deserving a price tag like that more than the Luxe. i would like to buy this gun so if you would please email me about this guns price i would appreciate it.